Large Internet companies are evolving with a common objective: occupying the whole life cycle of the client, focusing especially on the most interesting and juiciest part from a money point of view, the booking or the hotel transaction. Historically, the life cycle phases have been occupied by the giants of the industry with well-defined limits. However, today, all of this has changed. The cost of client acquisitions is too high to just let them go to the competition at the drop of a hat. The monetization of some stages (as inspiration or sharing) is very difficult and, on the other hand, in others (comparison or booking) it’s high and accepted by the hotel, who is used to paying out commissions. The industry’s leading OTA has managed to build loyalty in many of its users by making them go directly to Booking.com to choose their hotel, book it and share their experience. 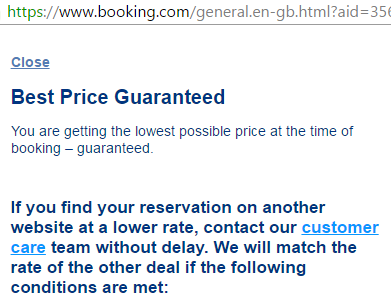 An aggressive “best price guarantee” policy which has made an impression on clients, something strange because, in fact, Booking.com rarely has the best price (for that, you just have to check Trivago or TripAdvisor to verify it). A loyalty programme, Booking Genius, where registered users access a 10% discount, which is surprisingly covered by the hotel who, as well as reducing its income, it is also admitting that Booking.com has a better price than its own website. A long-term strategy. For many clients, the simplicity, security and guarantees that Booking.com offers is worth paying for that little bit extra. For them, the Booking.com brand is above the price in terms of importance. TripAdvisor has recently completed a full transformation of its business model. With more than 320 million reviews, it’s one of the leaders in the “hotel search” stage. Its product, TripAdvisor TripConnect, strongly introduces it in the “price comparison” stage and, recently, TripAdvisor Instant Booking in the “booking” stage, which makes it a full-blown OTA. Who could have warned Expedia, back in 2011, that they were letting go what a few years later would become one of its main competitors? Google is the undisputed leader in the inspiration stage (who hasn’t searched for “holidays with children” or “weekend breaks” on it? ), but also in the “search” stage (e.g., hotels in the Canary Islands). Not satisfied with this, it has now launched itself to occupy the whole customer life cycle by firmly entering the phases of comparison and booking. Its recent and big commitment to close the circle. Only available on mobile searches for now, Google has surprised us all with a unique tool in this industry that should have Booking.com and TripAdvisor quite worried. Its name? Google Destinations. Its objective is no other than to channel the inspiration and search of everything related with travelling and destinations by naturally incorporating itself in Google search results. Once inside, Google tries to trap the user by offering everything he/she needs: information, photos, reviews, prices and, eventually, bookings. If Google gives me everything I need, why look somewhere else? Without doubt, Google will offer plenty to talk about with this new tool. It’s too soon to evaluate its impact but is seems quite obvious that it will be a success and that it will find its place among users. Where does Google Destinations get the hotel rates? From its HPA platform, which gathers them from the different OTAs and from the direct-sales companies (at Mirai we have had integration since 2013). Up until now, Google redirects the user to the OTA or to the hotel itself to complete the booking but I fear that this won’t last long. 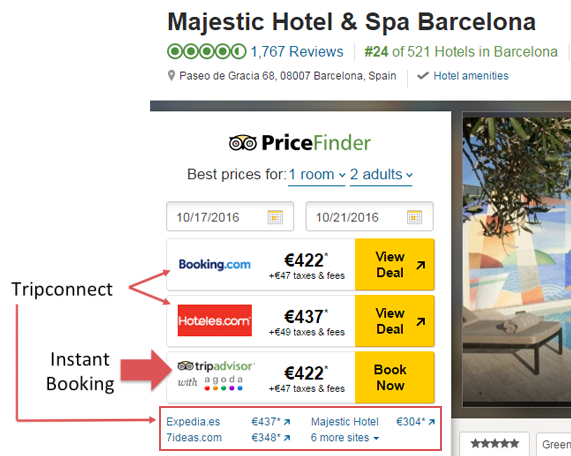 If Google is already dominating inspiration, search and currently entering price-comparison, it only needs to “attack” hotel bookings to close the circle and complete the user’s life cycle. With this objective, Google is already trying its booking system in the United States, where the user never leaves Google, making it an OTA, at least in the client’s eyes. This new model is known as Book on Google, but there are still many details that are yet to be disclosed. We will impatiently wait for more details. Same ending but different origin. 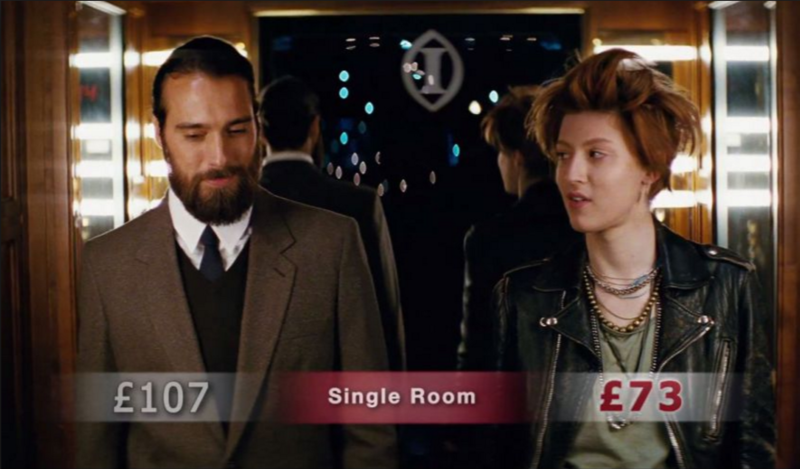 Trivago was born a few years ago and become the main hotel price-comparison tool. 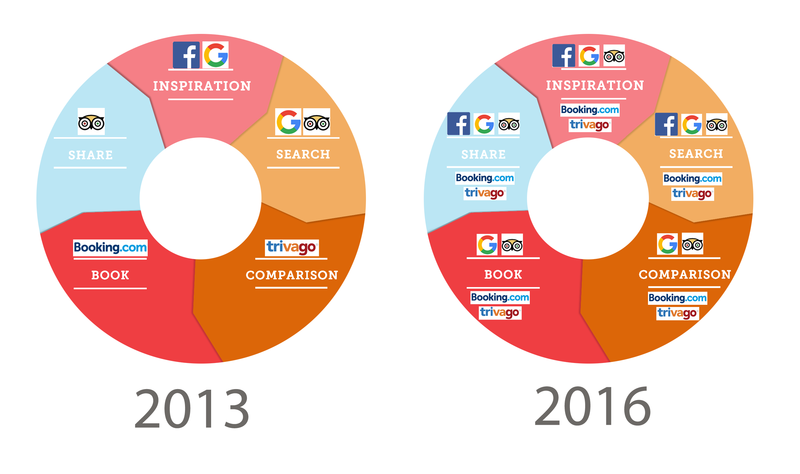 Just like TripAdvisor and Booking.com, Trivago has evolved by always putting the user at the centre of the strategy (its real client and not the hotel). It doesn’t just want to be a price-comparison website but also a hotel searching tool. For that purpose, it has bombarded us with television adverts with its catchy slogan “Hotel? Trivago”. This turn of events can easily be seen by comparing its TV adverts: Here is the one from 2011 and here is the most recent one from 2015. Trivago also has plans to enter the hotel booking phase. This system, still in its beta phase, is currently only available in certain markets like Germany. All of these changes create further confusion in an industry that’s already complicated in itself. Not being up to date means that you won’t be able to react in time and, eventually, these changes will affect your hotel in one way or another. However, these movements are not only threats but also opportunities for hotels to sell more at a lower cost. If you play your cards right and you are not afraid of intermediation, you will benefit from it. The fact that Booking.com, the leading OTA, completes the customer’s life cycle and its number of “direct” clients is growing is the worst possible scenario for you. These users will be captive of Booking.com and if your hotel wishes to have access to them you will have to accept their rules (quota, commissions, etc.) from now on. What is the difference between being a hotel owner or Booking.com selling you 60% of it? That TripAdvisor and Google are launching their own booking systems is also not good news, since it’s another wall created between client and hotel. However, when lacking direct inventory, it’s a chance for you to feed it to them. If you don’t, the OTAs will occupy this space and carry on selling what you could be selling yourself with your “direct channel”. The same happens with loyalty programmes. Will it be the next step for TripAdvisor or Google? While they don’t have them, you still have the chance to build customer loyalty with the clients that they may bring to you. The changes on the Internet are very quick. Intermediation has more money and knowledge, so it’s normal that they update before anyone else. Competing with them from a technological perspective is impossible. So the sooner you accept that the better. This is not your war. Remember, however, that there is something that will never change and that we often forget: the rooms are yours and not the OTA’s. Bearing this in mind, you can fight with these changes, bringing them always onto your turf and not onto the OTA’s. Esto va demasiado rápido, pero es lo que hay. Las tendencias cambian a una velocidad vertiginosa y los salvadores de ayer son la china en el zapato de hoy. ¿quiénes serán los próximos? ¿amazon, ebay, algo que ahora está en embrión o ni si quiera existe?. ¿la frase del CEO de Booking dándole a su compañía una vida de 5 años, es cierta? ¿fue esa la causa de su marginación que la globalización de la hipocresía y la doble moral atribuyen a un desliz amoroso?. El presente y el futuro en materia de distribución hoetelera son apasionantes. Pablo, gracias, una vez más, por tus opiniones. Ésta no es nuestra guerra. Es muy cierto, pero tampoco podemos quedarnos de brazos cruzados a verlas venir. Pero sinceramente, si de cada 10 habitaciones que pones a la venta Booking te vende 8 y las otras 2 entre tu canal directo y el resto de OTAs… qué puedes hacer? Mismas condiciones, mismo precio, misma disponibilidad… y la diferencia se encuentra básicamente en la visibilidad. Un estupendo artículo. La lucha por tomar la mejor posición en todas las facetas de la vida del cliente es impresionante. Nosotros hacemos un gran esfuerzo por transmitir a los estudiantes de nuestros cursos cómo es la situación más actual de las empresas del sector. Lecturas como esta ayudan mucho. Gracias.